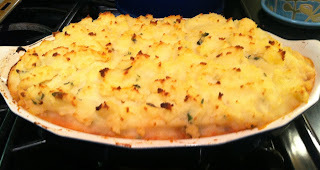 Fridge & Pantry Treasures: Shepherd's Pie! Chris and I were housebound all of last week due to Hurricane Sandy, and while we were safe and snug, not being able to leave easily for grocery runs put a bit of a strain on our food supply situation. One of the nights after the storm, we walked up to our local pub for some burgers. The usually packed, lively neighborhood place was "cash only" for the night and warmly lit with Christmas lights. The chef greeted us at the front door -- he was grilling everything on a huge outdoor charcoal grill. The smell of gasoline and the hum of the two generators in the back mixed with the tired voices of our neighbors -- some didn't have power or heat, some were visitors who came north from the ruined Jersey Shore and were staying with family. Others were a little stir crazy--with kids out of school, their patience wearing thin. But, the burgers were cooked perfectly, the butternut soup was hot (even if it was served in a paper bowl with a plastic spoon), and the beers were cold. We were happy to support our local restaurant, but, with trees down all around and power still out for most of the town, it wasn't a night to linger. We hurried back home to our warm, quiet nest -- thankful to be safe and content to be at home together. Obviously, not much else was open nearby, and with a gas shortage, we weren't going to go out to eat every night during our Hurricane Hiatus. 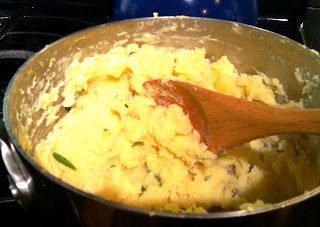 The next evening, I took stock of what I had to work with: lots of thyme, tarragon and parsley in my herb garden; mild Italian sausage, cooked/diced beets, raw/chopped spaghetti squash and a bag of peas in the freezer; butter, white wine, chicken stock and a container of strained tomatoes in the fridge; and apples, potatoes, onions and garlic in the pantry. I pulled everything out onto the counter and took a good long look. It looked like...Shepherd's Pie. So I threw one together. 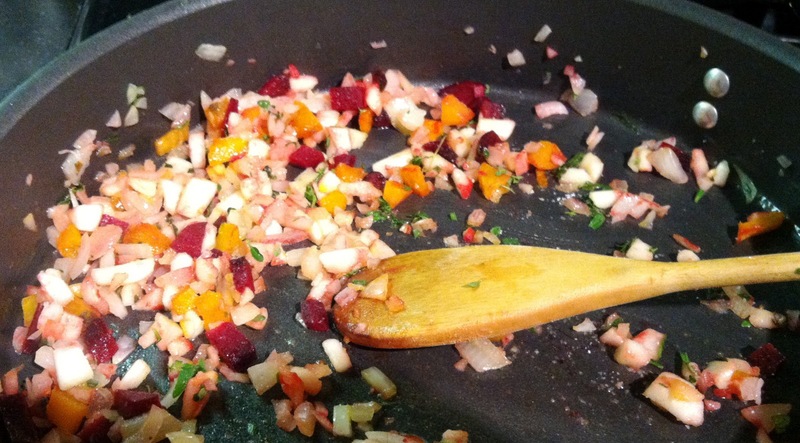 It's one of those dishes where you don't need to follow an actual recipe -- just choose ingredients that go well together and go for it. I took a large skillet and cooked the sausage (thawed and removed from casings and crumbled) until no longer pink, then set aside on paper towels. Then, I melted a TBS or so of butter in the sausage pan and stirred in some diced onion, garlic and apple (peeled/cored), and cooked until tender. After that, back in went the sausage along with the frozen beets and some wine and chicken broth, followed by the tomatoes. 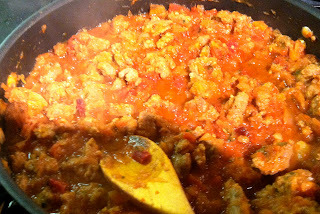 I stirred and cooked until everything was well incorporated, then added a pinch of cinnamon and a couple pinches of salt and some chopped herbs. In the meantime, I boiled the potatoes and the squash in separate pots until tender, then mashed the potatoes with some butter, and a handful of chopped herbs and set them aside. 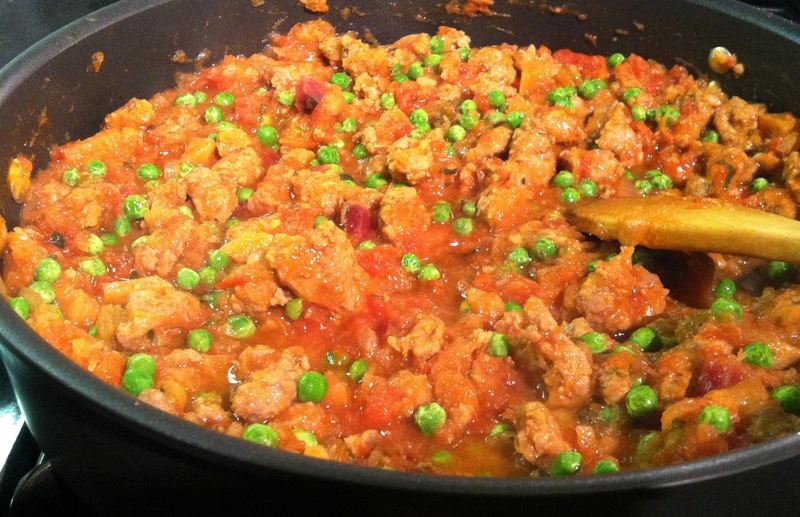 I stirred the squash (which had fallen apart into a lovely, stringy mass) into the sausage mixture and let it cook a few minutes more, before stirring in the frozen peas, which added a nice pop of color. 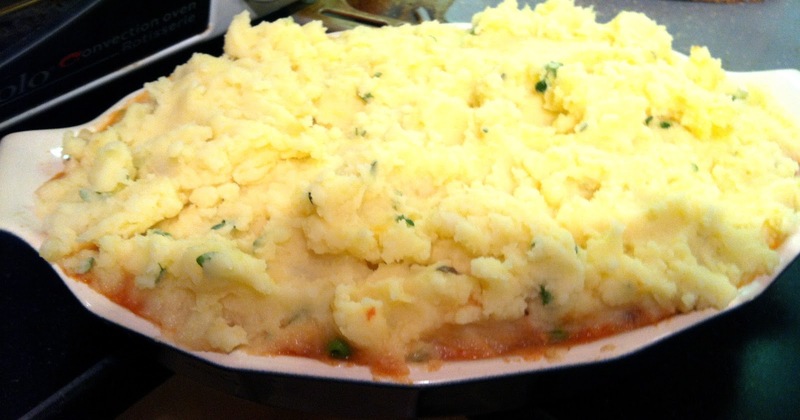 Then, I filled the bottom of a casserole dish with the sausage mixture and topped it with the potatoes. I baked at 375 for about 30 minutes, until the potatoes started to brown. The house smelled heavenly. 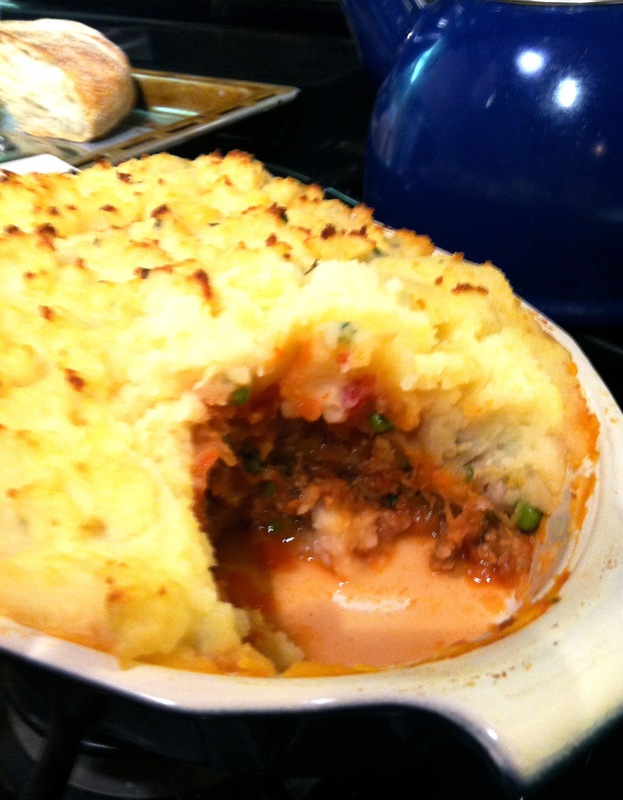 Served with a loaf of fresh-baked bread and a glass of wine, this bright, flavorful version put a welcome spin on the normally heavy Shepherd's Pie. Definitely a good use of our groceries...or what was left of them. Yum.